After a summer and early autumn feeling like I got to grips with making some pretty good cheeses, the late season milk has thrown me a curve ball. 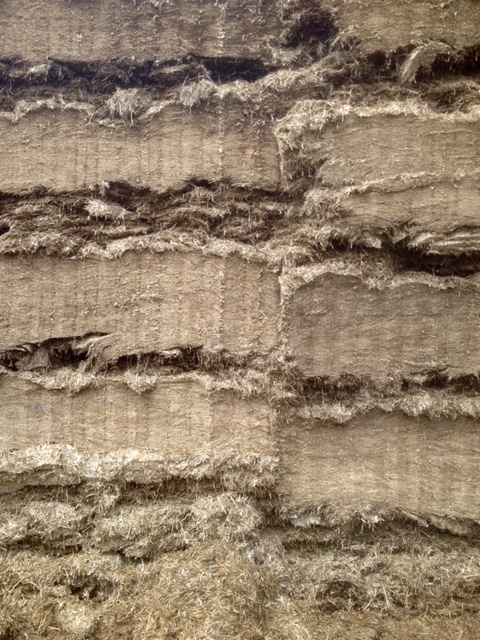 A lot is talked about seasonality in rather hazy, romantic terms of the terroir and what grasses or herbs or clover is available during the summer versus hay or silage in the winter. Or even slightly more scientifically in terms of levels of fats and proteins in late season milk. Very little, in my experience, is talked about in terms of temperature.We have recently had a head spinning turnaround from milk that set quickly and firmly (which we put down to high solids) to milk that just isn’t setting. Fats and proteins aren’t dramatically different from the fast setting curd milk, there may be a little less calcium in the milk due to the grass quality not being what it was but basically that doesn’t seem to be the key issue. Temperature. For starters, the milk that had been arriving in the dairy at 27C or more in fact earlier in the year is now about 18C or 19C. There are less sheep milking as more of them are served and those that are milking give less and less milk. The body temperature of each sheep and the temperature of milk coming from each sheep hasn’t changed, but other factors mean the milk is much colder. The sheep are milked before the cows. The pipework is cold in the mornings now as it’s autumn and in addition it’s dark when the milking starts so what sun or daylight there is has had no chance to raise the temperature of the air or surroundings. 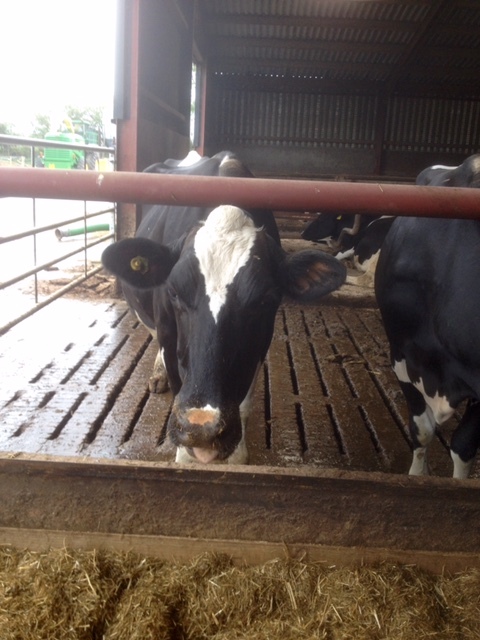 The milking system works by accumulating about 8 litres milk in a jar and then pumping it through into the dairy. However it now takes longer to accumulate the 8 litres allowing the milk longer to cool as it does so. It’s then pumped through cold pipes into the dairy. Then there’s the room temperature or really to put it more accurately, drafts and currents of cold air. If you look at the thermometer in the room the temperature hasn’t dropped massively and the heaters are going full blast and turned up as high as they can be. However in the corridor where we do the packing the temperature is quite a bit colder which means that at this time of year, doors need to be closed to preserve the temperature in the dairy. In the past couple of weeks the milk has gone from setting a bit too quickly because of its solids to setting very very slowly. Thinking back, the last of our fast setting milk was also at a point when the days were a little longer and then there was the brief Indian Summer when everyone went to the beach in October. As the weather broke, the setting problems begain. In looking at why this is happening (largely to me but it has happened to Martin too) we’ve looked very closely at the different ways in which temperature affects what we’re doing and how without us actually changing what we do, the parameters have entirely altered just because it’s autumn and we have less milk. 1. The milk is colder. Any time it is left standing before the starter goes in, used to be a brief period of pre-ripening time as it was at 27C but very little is happening at 18C. The lactic acid bacteria activity from the milk itself and from the starter once added is less even if the milk is heated and the starter added at around 31C because where there was a pre-ripening period, now there isn’t. This in turn affects the quality of the set because the beginnings of acidification would free up a certain amount of calcium ions from the milk which helps for a good set and increases the yield. 2. The milk needs to be warmed up much more slowly and consistently. To heat quickly, using the ‘flag’ or mini radiator type thing we use to warm milk (it works by running hot water through it) and stir the hot milk in, means it loses temperature more quickly. 3. Even warmed more slowly, the milk doesn’t keep its temperature in the same way because there’s much less of it. Whereas with quantities like 70 or 80 litres, the milk might drop 1 degree between adding starter and then adding rennet an hour later, it can now drop 2 or 3 degrees. Losing temperature more easily again of course means the set will be weaker. 4. 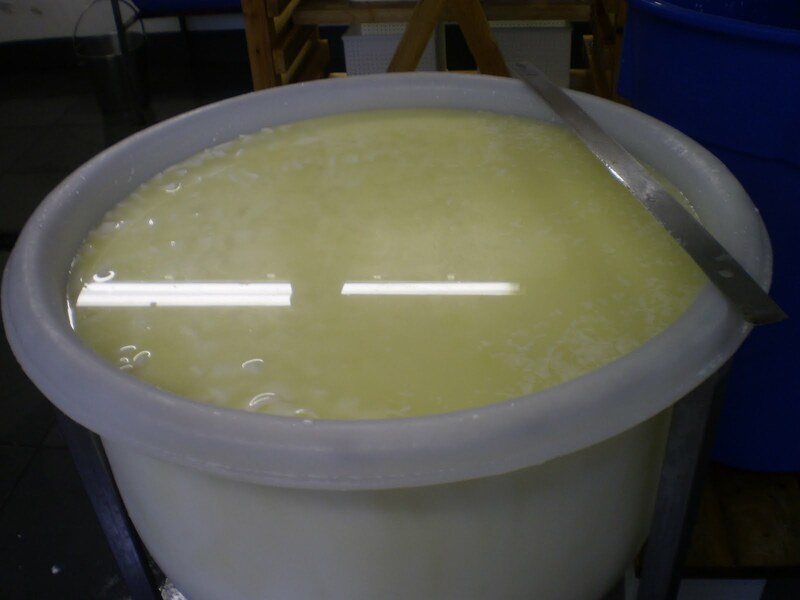 The top of the curd, where you usually test the set, is colder than the lower part of the vat as it’s the area that’s open to the air the most. Often this will set more weakly than lower down the vat. Even by increasing rennet and trying to keep the vat next to the dairy’s heaters at all times after it’s been heated, the set just isn’t as strong as it has been. The implications of this on the cheese are pretty huge. 1. Weak curd forms a more sloppy substance going into the cloths. Small and more mushy particles of curd clog up the cloths and reduce the effectiveness with which they let the cheeses drain. 2. Weaker and colder curd drains more slowly anyway. It doesn’t free drain in the same way. More cloth pulling only has a limited effectiveness as the cloths are clogged up already and also because with a weaker structure you end up losing fats and squashing the nutrients out of the curd by using more force but still finding that it feels soft and wet in texture. Badly formed rinds because they are largely formed from the soft particles that collected on the cloths. When salting or maturing further, these rinds are loose, too moist and come away from the cheese. Cheeses that hold free moisture. That old enemy we’ve been fighting with our draining cloths! Because the cloths are clogged up, hindering drainage but also because the curd didn’t have enough resistance to the cloths to force out the free moisture when they were pulled up tightly and in the end slightly collapsed under the pressure we have floppier and less stable cheeses when they are turned out. The effect of this is that the cheeses do not mature in a stable manner. They don’t retain the calcium which will allow a full and elastic breakdown and they develop what is more of a lactic cheese texture with a very runny breakdown just under the rinds and a curdy, moist, acidic centre. It’s not that this is unpleasant to eat, in fact it can be very tasty, it’s just not what we want. Before I began making cheese, I might have tried to explain this to a customer by saying that at the end of lactation with the milk composition being different and the pasture being different, the cheese would change. Having made cheese for a few months, I would now tell it very differently. The biggest change has been the temperature. So much for terroir! As the milk amounts decline (the tups went in last week and half the ewes are now served), I’ve been thinking back to when I started making cheese in April and how the way we make cheese now has changed.The biggest change is that we’ve slowed the recipe right down. Whereas we were heating the milk up to achieve a set time of an hour and then having to work the draining cloths hard to get the free moisture out of the mass of curd bits, we’re now getting a set time of more like an hour and a half or longer. We’re not heating the milk as much now. In fact I’m not heating it at all. I do take the temperature of the milk when the starter goes in and from that, I’ll work out (in a slightly guess-work style it has to be said) how much rennet I want to add to get the set time of an hour and a half. Sometimes this works out and sometimes I get it wrong and it goes slower than that but, on the whole, it does seem to work out that if the milk is around 27C then 1ml rennet to 5l milk seems to be the right quantity. If the milk is warmer, say around 30C, then 1ml rennet to 7l milk seems to get a set time of an hour and a half. If hotter, still like 33C which was the temperature on the occasion I first got the hour and a half set by adding too little rennet by mistake, 1ml rennet to 10l milk. So I adjust how much rennet to use roughly based around that scale. I think that this suits me better because I’m not the sort of person who can cook to a recipe every day. I like to get the gist of a technique and then cook it my way. Certainly looking ahead to when I’m doing my own thing, this is something I’d be interested in continuing. At the beginning of the season, of course, I couldn’t apply this attitude to cooking, to cheesemaking. I needed to stick to the recipe religiously because I didn’t have the experience and also because I’m making cheese for someone else. It wasn’t my sales on the line if I messed it up. I suppose with a bit of experience and practice I’ve got more confidence now to react more to the circumstances of the milk temperature on the day rather than make it do what I want and heat it to a specific temperature every day. It seems to be a more forgiving recipe that we’re using now with the longer set. There’s more moisture but it’s not free moisture. The curd is more fragile and needs more gentle cloth pulling but still seems to drain appropriately anyway. Even moister cheeses still don’t have the levels of free moisture. The first cheeses made with this sort of set, are maturing rather nicely. I like the texture of the one cheese I’ve kept back in the stores (and that I’ve marked for me to buy for myself when it’s ready). The other thing is that we’re leaving the starter for about an hour to mix and get working in the liquid milk before adding the rennet. The idea behind this is that the bacteria can get going better because it should be easier for them to get distributed and to get dividing in a liquid rather than in the set curd. Or so we hypothesise anyway. Another thing that should help this also is the fact that at temperatures like 27C, the milk reaches its first fragile set much more slowly. In fact it can still be liquid an hour after the rennet has been added but still reaches the firm set (or second set as it can be known) in about an hour and a half or a little longer. My gut feeling is that this long set and longer ripening time will make a good texture and flavour when the cheeses are mature and ready to sell. Time will tell I suppose, but if the mistake cheeses of the 28th June are anything to go by, I can allow myself to be cautiously optimistic. As the sheeps milk decreases and due to a phone conversation Martin had with Randolph, we have been looking at temperatures of our make recently. Out at Randolph’s country residence Old Kate’s Farm, Dr Jemima Cordle has been conducting cheesemaking experiments. According to Martin, she’s been making cheese to roughly a St James recipe but playing with different temperatures and amounts of rennet to see what gets the best results in terms of producing heavier cheeses and a greater yield of cheese. Obviously as we have less milk, that’s quite an attractive idea to us too.Perhaps a little ambitiously we thought we’d try dropping the temperatures slightly before we had a truly accurate way of recording the temperature. The floating thermometer we have been using is about 9 degrees out. The recipe for St James calls for setting the milk at 31C and by the thermometer we had been using, we were setting it at 23C. You’d think that knowing this, we could drop to setting at what the thermometer tells us is 22C and try experimenting. However, as it turns out, the thermometer is inconsistently inaccurate – great. The first 2 days experiments have had to be discounted due to too much yeast in the starter which lead to gassy cheeses. Dropping the temperature just a little slowed down the drainage and allowed them to take advantage of the extra moisture and get going far more than we wanted. Experiment abandoned we invested in a good digital thermometer and realised that our previous 23C was in fact about 33C by the new equipment standards. The temptation at this point would be to return to 31C set straight away, but by setting at 33C we had actually been getting a set time of about an hour and sometimes longer (which is not too short a time for this recipe) and more importantly the cheese has been good. The NYD mongers have been reporting good things and the cheeses on Martin’s counter at Cartmel have also been tasting good. So while that’s hotter than we’d intended, if it ain’t broke don’t try and fix it all at once. We agreed to drop to 32C set temperature for starters and gradually reduce it from there on. The temperature and set time that Jemima had found to yield most cheese is 28C and a set of an hour and a half which is longer than we have yet achieved. By setting at what is probably 33C (it was with the old thermometer) and using half the usual quantities of rennet by mistake (1ml to every 10 litres rather than to every 5 litres) I did manage to get a set of an hour and a half. The curd did set and it was a nice consistency at both cutting and ladling but the texture of the cheese is quite different to the usual St James. It’s moist and succulent but sandy in texture. In fact it reminds me of young Stichelton which considering that that is a cheese made with very small quantities of rennet is perhaps not entirely surprising. However until it matures, we can’t be sure if dropping the rennet quite that drastically is a good thing or not. Sometimes by making mistakes, you stumble on something good. Sometimes, you don’t. However armed with new thermometer in hand, I have been dropping the temperature a little by degrees. For a few days I was renneting at between 32 & 33C (we can measure in decimal points now) and in the past couple of days I’ve dropped it further to between 31 and 32C. Martin remains nervous about gassy cheeses, but by adapting the draining cloth work, I think we’re avoiding them. In fact even the yeasty cheeses we made about a fortnight ago haven’t remained gassy although they haven’t drained as I’d like either. But they’ll be ok – not amazing but ok and for a while we weren’t sure that would be the case. As far as set time goes, the magic hour and a half has eluded me so far but the set is a little over an hour – generally about an hour and a quarter. The effect of dropping the temperature on the draining was the biggest difference I noticed. It’s manageable but the curd drains less freely. This really should be expected. As I understand it, the reason for this slower and longer set is that rather than forming a number of stronger bonds as the curd solidifies, it forms perhaps weaker bonds but more of them and this at the end of the day forms a more effective net in which to trap moisture and fats so that the curd releases less whey when it is cut and left to rest and it needs more encouragement to continue draining after ladling. The texture at cutting and ladling is less firm and it actually feels really nice to work with – more like gliding a knife through it than making the effort to cut. After the curd is in its moulds however this means that it’s delicate and you can’t pull the cloths up as tightly as quickly. So the cloths are pulled up and tucked in gently after ladling is finished. The second cloth pull is 20 minutes later and whereas since then we’d been waiting for an hour to do it again, I now find that it needs looking at anywhere from half an hour to 40 minutes later instead. At this point the curd is getting firmer and can stand a tighter cloth pull in which I aim to have pulled the curd in from the side of the mould so that it doesn’t touch the sides of the mould all the way round. I won’t neccessarily have it pulled in so that it stands alone all the way round but certainly on some sides or corners it will. The final cloth pull is then an hour after this and again can be pulled up quite firmly with the aim of standing alone from the sides of the mould as much as possible. I usually have some cleaning or cheese turning to do after that and I’ve been keeping in mind the idea of a 4th cloth pull but so far by the time I get to cloth pull 3 I feel it’s probably drained enough. The following morning, in general, the cheeses feel firm and well drained, perhaps a little softer than those made at the higher temperatures but no squelching that indicates free moisture. 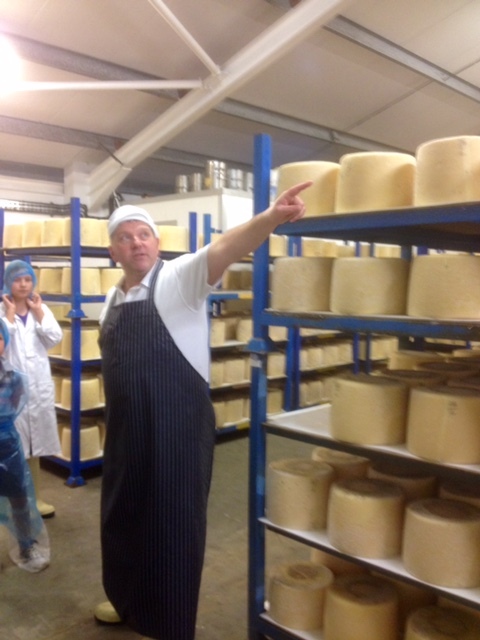 In terms of yield and weight and whether we are getting more cheese as a result, my gut feeling is that we are. Certainly in the last couple of days when I dropped down to between 31 & 32C, I seem to be getting more cheese than I’d expect. I am not sure about what they weigh, but they seem to be perfectly reasonable sized cheeses and as they are well drained, it’s not trapped whey making them that size. What I have noticed is that where I’d expect to get 11 cheeses by a process of calculation alone, I get 12 and where I thought I would get 10, I got 11. In part this can be explained by the composition of the milk – it has higher solids in the latter half of the season than at the beginning but my gut feeling is that it is helped by the temperature and length of set too. Certainly at this stage of the season when we’re very nearly down to 1 vat of milk only, every little extra is going to help. The downside is that the longer set and lower temperatures can favour things like yeasts if the drainage doesn’t work so getting those cloths attended to turns out to be pretty vital. Resting curd just before ladling. This is the stage at which less moisture releases naturally at the lower temperatures and so more attention is needed to the cloth stages later. This week saw the return of Swallet for a couple of days. Swallet is a little disc of lactic set cheese which if all goes to plan has a creamy white wrinkled geotrichum rind and the recipe is more or less the Perail recipe but with a little adaptation. The process actually takes a day and a bit until there is anything that looks like a cheese, but it actually requires not so much intervention from the cheesemaker. Basically your job is to help the curd do what comes naturally to a certain extent.The milk is collected on the day of milking. It is cooled a few degrees from the sheep temperature that it comes in at and starter is added. It’s the same yoghurt consistency bulk starter that we use for St James and it is left then to grow and for the acidity to build. A very small quantity of rennet is added that afternoon and it is left to set slowly overnight. The following morning the curd has set and about 24 hours from the addition of the starter, we begin to ladle it out into moulds. 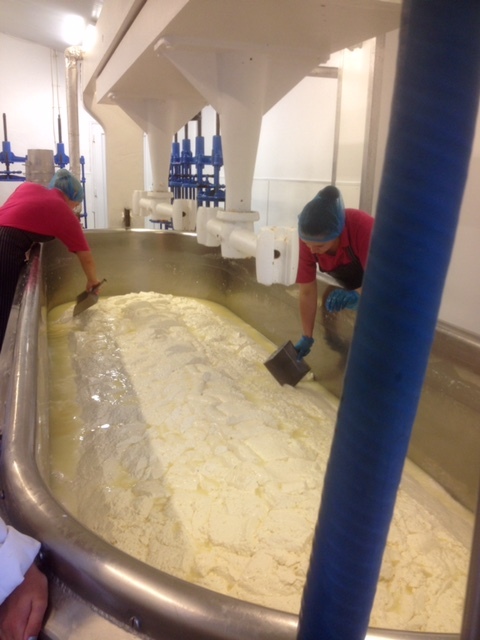 Each mould takes about a couple of ladles full of curd and it is then left to drain for about 4 hours before being turned in its moulds and then left overnight again to drain. 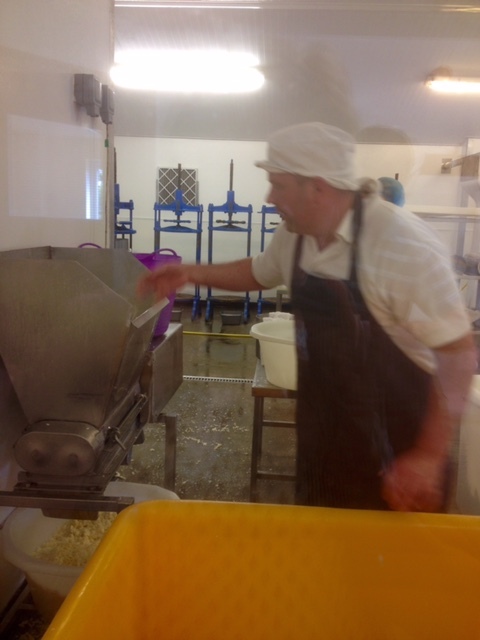 The following morning we turn the cheeses out onto racks and sprinkle salt over one side. 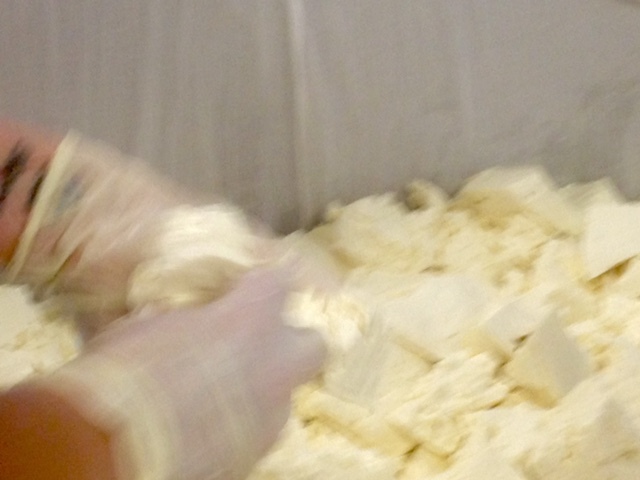 The cheeses are moved into a humid and warm room which has the right conditions to encourage the geotrichum to start growing and then turned and salted on the other side the following day. After that it’s a matter of judgement as to when the cheeses are ready to move to a colder and drier environment once the rind has established itself. Making Swallet basically uses the natural souring of the milk with a little help from additional starter and although a small amount of rennet is added, it also uses the setting ability of milk when a certain acidity is reached. This means that actually these are technically fascinating cheeses because you are relying on the action of the acidity and the rennet enzymes to squeeze moisture out of the curd rather than, as with St James, cutting the curd to let whey out before ladling. To be honest, it takes a bit of understanding, because there isn’t the same human intervention and it also relies on some quite subtle observations of the curd, in particular, ideally, monitoring of the curd pH which we aren’t able to do at the moment (the meter is broken). The pH reading can of course correlate to observations on the appearance of the curd but it does take a practised eye. Martin says it took him a few months to get his head round how to make it successfully and I suspect that may be the case for me too. So whereas last week’s introduction to St James could be quite lengthy, this is very much just an introduction. I have more questions to ask over the next few weeks as we make more of Swallet perhaps once a week if not even less and when I have got my head round what we’re doing a little better, I’ll return to why we do what we do.